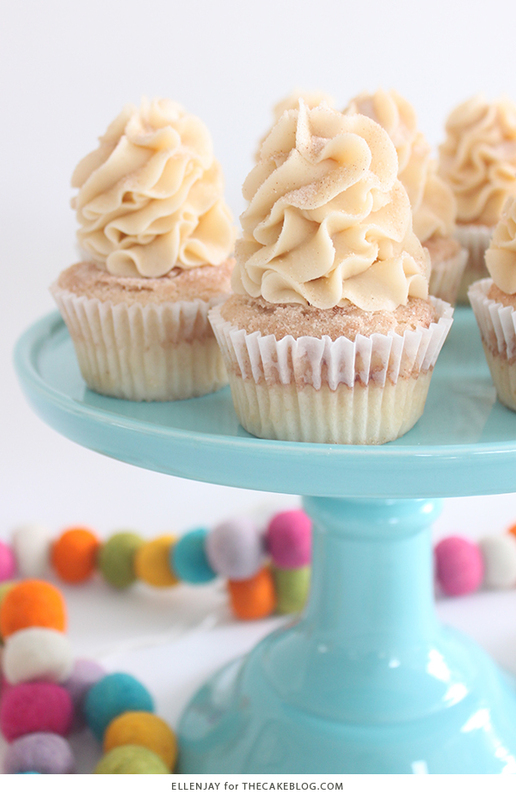 Snickerdoodle Cupcakes – cinnamon sugar cupcakes topped with delicious brown sugar buttercream. A holiday cupcake recipe inspired by the classic Christmas cookie, created by our contributors, ellenJAY. We’re sure your holiday to-do’s are a mile-long by now, and you’re in the process of whipping up all your family-favorite holiday cookies and cakes to share with friends and neighbors. We’ll we’re here to suggest one more recipe for you to add to this year’s holiday baking list. 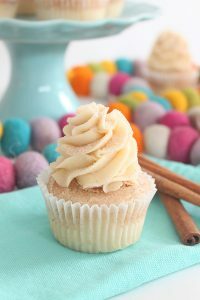 Our Snickerdoodle Cupcakes with Brown Sugar Buttercream are a spin-off of the always popular snickerdoodle cookie and are sure to be a hit at your next gathering. This easy-peasy recipe will leave you feeling quite accomplished amongst the hustle and bustle, and we guarantee you will get two thumbs up from anyone who has the pleasure of enjoying one! These cupcakes can we whipped together in no time and are sure to be a crowd pleaser, especially with the kiddos! 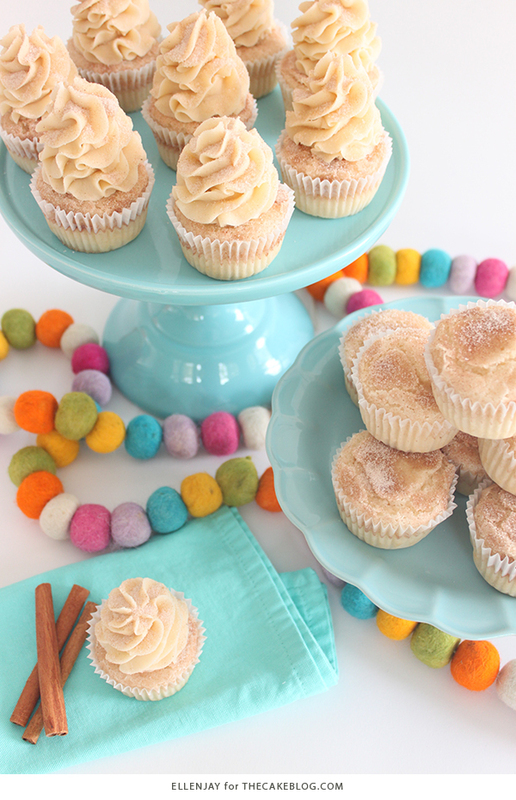 (Our kids sure did love gobbling up these cinnamon-sugar laden treats…after all they are our #1 taste testers!) They’re also the perfect little helpers to get involved in the kitchen to help with the sprinkling of the cinnamon and sugar mixture. And as an added bonus…these cupcakes taste amazing fresh from the oven. So if you’re in a pinch and don’t have time to whip up the frosting, don’t worry! These cupcakes will still be a homerun! Trust us, you won’t be able to stop at eating just one. The texture is so tender and soft and the cinnamon-sugar crackle on top provides an extra bit of sweetness that makes them super yummy if you have to forgo the frosting, which means they’re perfect for breakfast too. 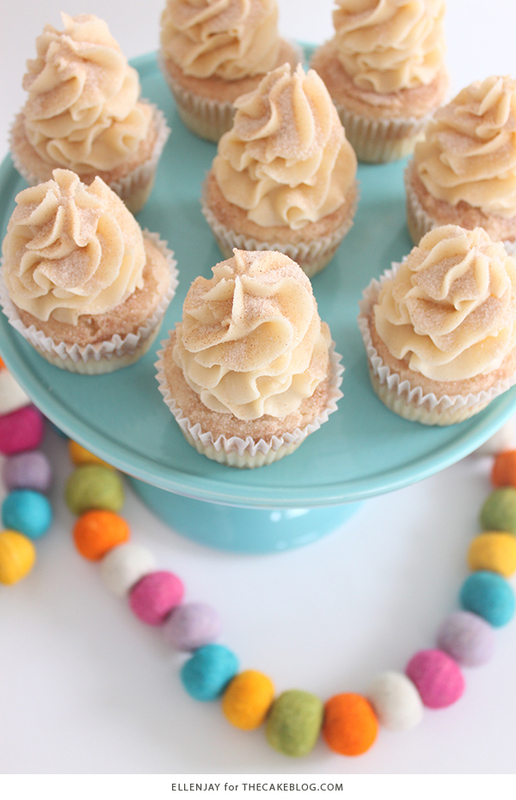 But of course we highly recommend you save time to make the brown sugar buttercream, because oh my golly it sure is amazing! Dusted with one final sprinkling of cinnamon and sugar, these cupcakes have the perfect little crunch when you sink your teeth in. 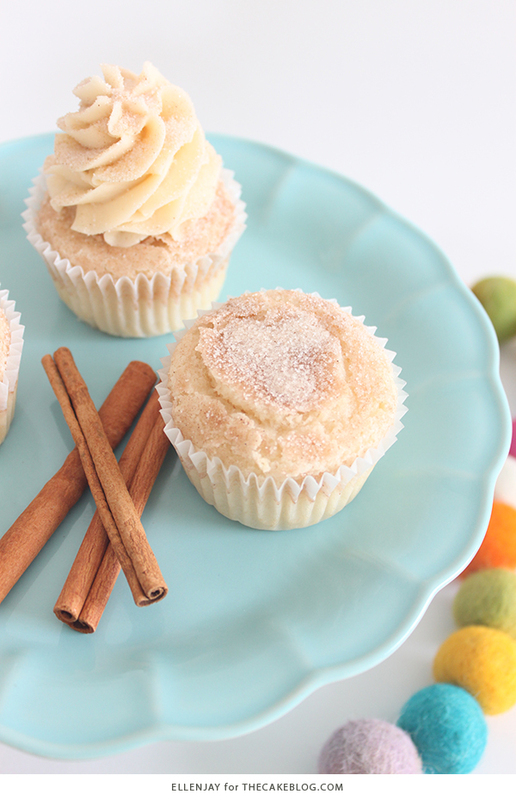 So grab your favorite apron, turn on the holiday tunes and whip up a batch of these scrumptious Snickerdoodle cupcakes today. Happy holidays friends! Preheat oven to 350F and line cupcake pan with cupcake liners. In medium bowl combine dry ingredients: flour, baking powder, baking soda and salt. In microwave safe bowl, melt butter. Then whisk in the sugar, buttermilk, sour cream and vanilla. Add the liquid ingredients to the dry ingredients and mix until combined. In bowl of stand mixer, beat egg whites until soft peaks form. Fold into the batter until combined. 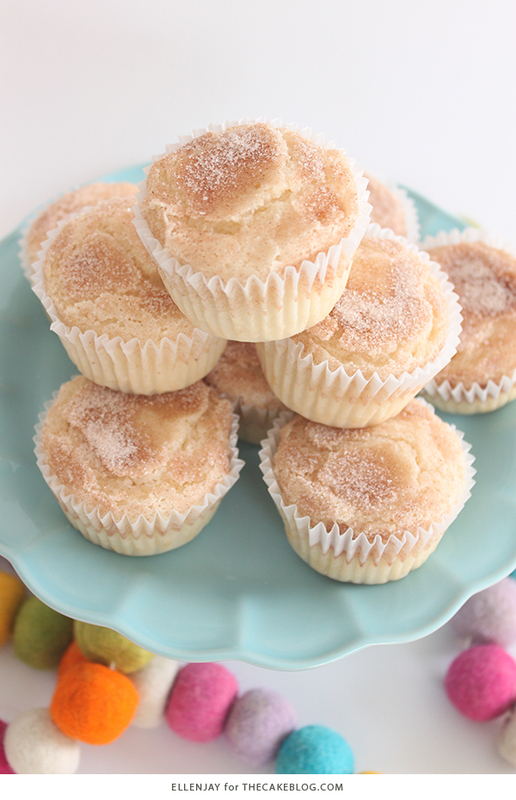 Mix sugar and cinnamon topping together and sprinkle ½ teaspoon on top of each cupcake. Reserve remaining for final décor. Bake for 15-18 minutes, or until toothpick inserted comes out with a few crumbs. Mix butter, brown sugar and vanilla in bowl of stand mixer on medium speed for 2 minutes, until smooth. Reduce mixer speed to low, and slowly add in confectioners’ sugar 1 cup at a time while mixer is running and mix until smooth. Prepare a piping bag fitted with a 1M tip and fill with frosting. 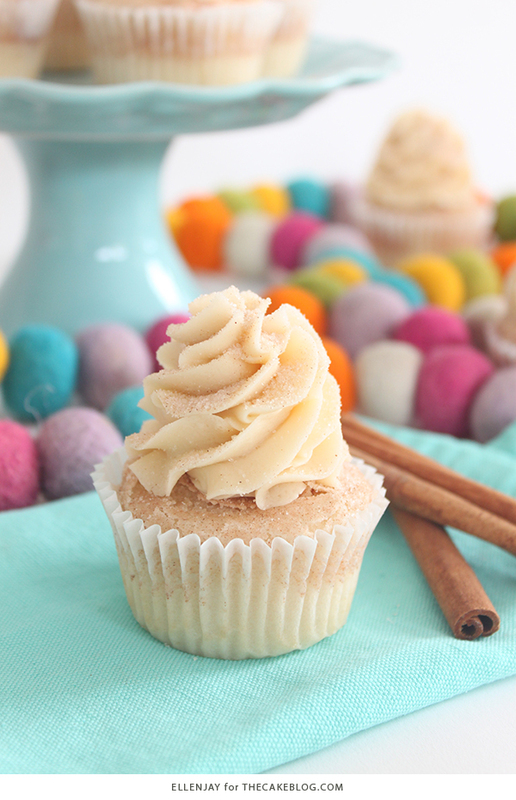 Swirl buttercream on top cupcakes and sprinkle with remaining cinnamon-sugar mixture. Hi I love your blog and have subscribed to it for a while now, however recently I was diagnosed with Hashimotos, an autoimmune disease that attacks my thyroid. Due to this I am now gluten-free and would like to know if there is any way of adding gluten free versions of some of your recipes on to your site? Thanks and have a great Christmas! Hi Noellia! I’m sorry to hear about your health issues and understand the need to make lifestyle changes. I’ve been debating adding some gluten free recipes to our site for awhile now. Perhaps this is something we can tackle in 2018. Take care of yourself! And thanks for reading!! 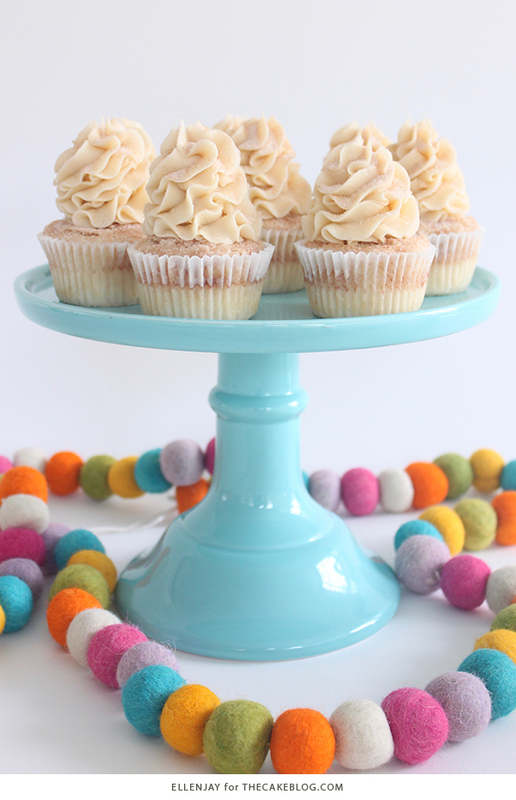 I’m so excited to make these cupcakes – they’re beautiful! I’m new to frosting and was wondering if you could tell me which “technique” you featured – is it the “beehive” or just a swirl? Thanks! Hi Heidi! I’m not sure of the technical difference between a “beehive” and a “swirl”, lol. But Lauren and Jennifer used a tip 1M and swirled it up high and narrow (notice the frosting does not go all the way out to the edge of the cupcake). Hope that helps! Followed recipe, helped my 4yo make them for papas bday. Folded in the whites for him, in the oven I watched them puff up but once they came out they deflated. 🙁 everyone said they still tasted amazing. What did I do wrong with the egg whites to better help my son the next time?! I made these yesterday and most of the cupcakes had the paper liners “blowout” while they were cooling. Could this be due to the cinnamon/sugar topping? Do I need to puncture it in the future? I learned my lesson about storing them before they were cool but this happened during cooling. Nice recipe! i will try. Stumbled across this recipe just looking for good Christmas recipes to try, and I am so happy I did. It is INCREDIBLE. Wouldn’t change a thing, turned out perfect. If you like snickerdoodles as much as I do, this one is a must!